Hello everyone, I’ve been asked for it lately so today I’m going to be doing a Casio Tough Solar watch review. I’ll be taking a look at how the Tough Solar movement works and its history before finally feature 5 very popular Casio Tough Solar watches. There will be a couple of very affordable models followed by some of their higher end selection so there’s hopefully something for everyone here today. How do Tough Solar watches work? So how do these Casio Tough solar watches actually work? Solar watches use the power of light to run. The solar field within the watch catch the light and transform it into energy used to power the operation of the watch. The Casio Tough Solar System is now so advanced it can use both natural or artificial lighting, even very weak light sources to sufficiently operate their timepieces. They use very small solar cells that are inconspicuous which can easily be integrated into the design of every watch face, this is assisted by the fact that the solar field can be manufactured in any colour and design. A neat bit of technology found on every solar watch from Casio is an accumulator. The job of the accumulator is to save excess energy and release it as and when is needed when the watch is in darkness. These charge automatically and don’t require any manual activation on your part. Are Casio Tough Solar watches good? 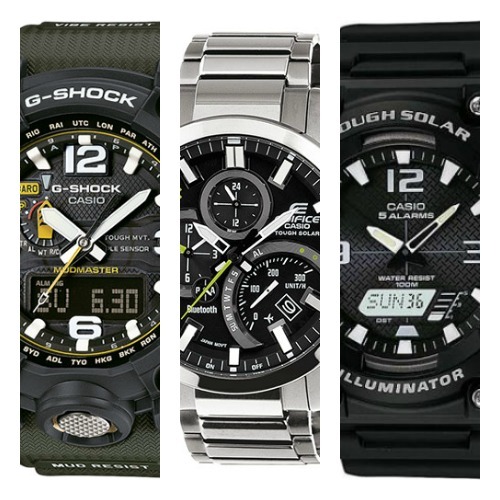 Casio’s range of Tough Solar watches come in a huge variety of designs and styles to suit every price range. You’ll see from the small list of 5 watches below that you can go from a very affordable modest Tough Solar watch all the way up to their higher end models. 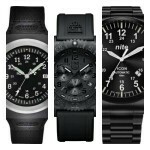 We’ve featured these Casio Solar watches to simply give you an idea of what’s available out there. But are Casio Tough Solar watches any good? In my opinion yes. 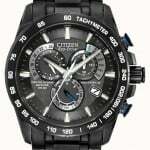 I think the idea of a solar powered watch is brilliant, and Citizen have had so much success with their range of Eco-Drive solar watches that the majority of their timepieces now feature it. Removing the need of battery changing also saves time and money, and with the saving of batteries, it can be a more eco-friendly option. For all these reasons yes, I think Tough Solar watches are good. Below I’ve listed 5 popular Casio Tough Solar watches for you to take a look at to get an idea of what’s available from this brand. They tend to be highly functional tough watches with oversized designs. If you have any questions about any of the watches featured below just comment at the bottom and I’ll try and help you out as best I can. 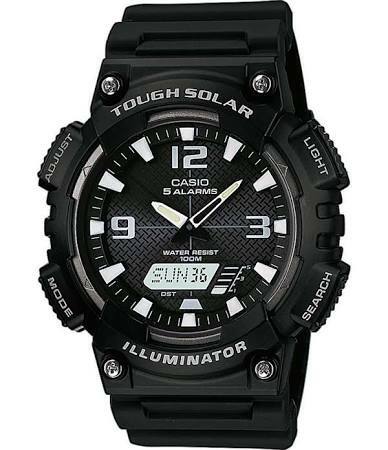 The first Casio Tough Solar watch we’re featuring today is one of the most affordable models available. This men’s Casio alarm chronograph watch is built with a large plastic/resin casing that has a diameter of 46mm with a thickness of 13mm making it an oversized men’s watch. The strap is also made of a sturdy rubber and fastens with a buckle style clasp. This model actually featured in our 15 best watches for teenagers due to its affordability. The dial has this nice and easy to read display with the hands showing up clearly against the black background. The hour markers also show up quite clearly. There’s a small digital display which is used to showcase various functions of the watch explained below. As is popular with these style of Casio watches this timepiece has a large selection of useful features and functions. These include an LED light, world time function, stop watch, 2 timers, 5 daily alarms, automatic calendar and 12/24 hour timekeeping. This Casio watch is powered by the Tough Solar technology which means it uses light (even artificial) to charge up the timepiece and keep it working even after darkness for many months. It’s an accurate and reliable movement that never requires a battery. A mineral crystal glass protects the front of the watch from scratches and shattering as is a common choice for these active watches. It also has a rather useful 100m water resistance rating which is great to see. You can read my full AQ-S810W-1AVEF Casio Tough Solar watch review here soon. 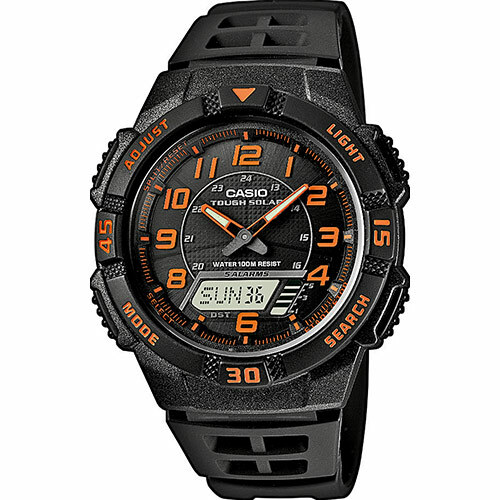 Up next we have another popular Casio Tough Solar watch this time with some brilliant orange detailing. This chronograph Casio watch has a large 42mm protective casing with a thickness of 11mm. The strap is made of a comfortable rubber and fastens with a buckle style clasp. I love the dial design of this watch with its high visibility finish, the orange numerals and outlines of the watch hands make it really stand out against the black background. Like the previous affordable Casio watch this model also has a small digital display. Features of this Casio timepiece include a countdown timer, multi alarm, world time display, stopwatch, calendar, and a LED backlight. As is obvious from the title of the article, this model also features a Casio Tough Solar movement that means it uses light to run the watch and can store excess energy to stay running for many months in the dark. It’s an accurate and reliable technology that’s found in many Casio watches. The lens protecting the dial is made of a mineral crystal that offers a good level of scratch and shatter resistance. The watch also has a 100m water resistance rating. You can read my full AQ-S800W-1B2VEF Casio Tough Solar watch review here soon. Next up on our Casio Tough Solar watches review is this mid range G-Shock solar powered watch. 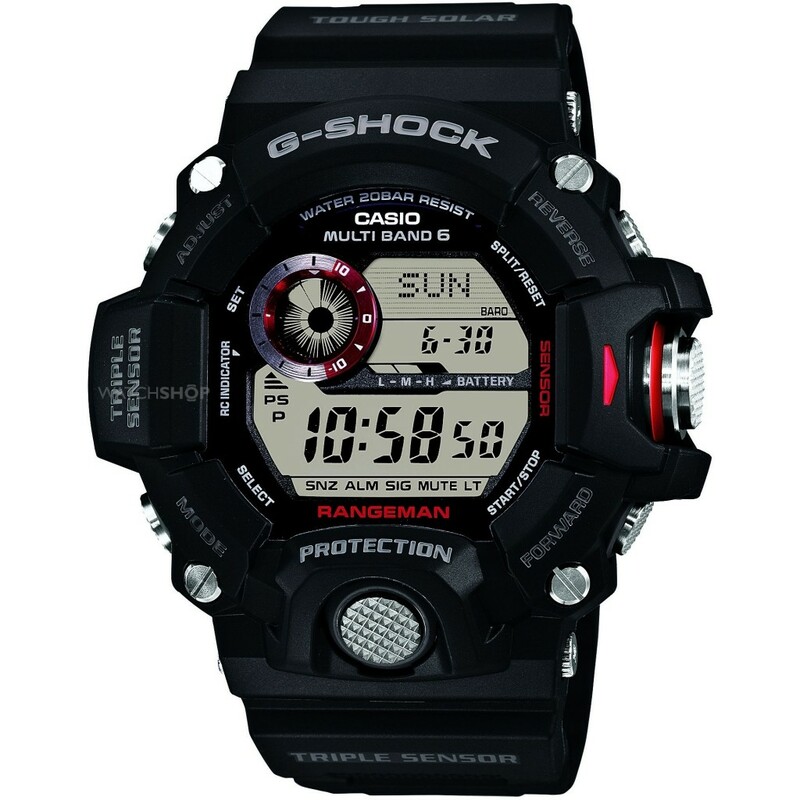 The Casio Rangeman is a popular premium G-Shock watch. It features an extra large oversized design with a thick protective resin casing that gives it a diameter of 53mm with an 18mm thickness making it a fairly chunky watch. It’s been paired up with a sturdy plastic/resin strap that fastens with a buckle style clasp. This men’s G-Shock watch features a large clear and easy to read digital LCD display. This is required to show off all the information from the variety of impressive functions this watch has. The display can be lit up by a Super-Full-Auto-LED light for excellent visibility in dim lit conditions. So what features does this G-Shock Rangeman come with? Well, it’s completely jam packed with them to be fair. They include: Shock resistant design, Radio signal reception (EU, USA, Japan, China), Thermometer, Barometer, Digital compass, 10,000 Altimeter, Sunrise/sunset display, altimeter data memory, stopwatch function, world time display, 5 daily alarms, snooze feature, automatic calendar, 12/24 hour timekeeping, and a battery level indicator. You have to admit that’s pretty impressive for the price. Powering this highly functional watch is a Casio Tough Solar movement that uses light be it artificial or natural to charge up the watch, it can even stay running after staying in the dark for months. The Radio controlled nature of this watch makes it extremely accurate as it can sync up with an atomic clock. As per usual a mineral crystal glass protects from scratches and shattering which is good to see. It also has a very good 200m water resistance rating. You can read my full GW-9400-1ER Casio Tough Solar watch review here soon. This watch also featured in our 15 best digital watches for men. 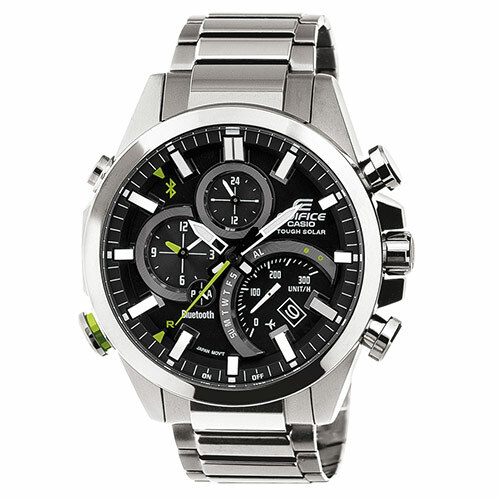 In at number 4 we have a timepiece from the extremely popular Casio Edifice watches collection. Just like the previous watch this timepiece also has an array of very useful features and functions which I’ll list out in one of the following paragraphs. 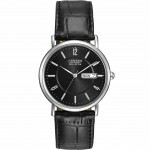 This large gents Casio watch has a stainless steel casing with a diameter of 43mm and a thickness of 15mm. The strap of the watch is also made of stainless steel and fastens with a push release fold over style clasp. For more great watches like this one you should read my Edifice Casio watches review. The dial has a bold easy to read display with these large white baton style hour markers and prominent white tipped watch hands. The hands and hour markers have a Neobrite coating for long-term illumination in the dark after a short exposure to light. There’s a world time dial at the 9 o’clock position which can be set to approximately 300 cities around the globe. There’s also a useful day and date display between the 4 and 5 o’clock hour markers. This watch features a mobile link function which wirelessly connects to your phone with Bluetooth smart devices. It requires the download of the Casio Watch+ app which is available on the Google Play Store and the Apple App Store for compatible devices. Downloading this allows access to the full range of features on this watch. You can use your phone to adjust hand positions and set alarm times, change distance settings for calculating speed in the stopwatch mode and transfer stopwatch data. Once linked you can also use your watch to make your phone emit a tone at the press of the button to help find your phone. You can also check for new emails via the watch. Traditional functions include a dual dial world time display, daily alarm, 100m water resistance, day indicator, and a date display. Powering this Casio Edifice watch is a Tough Solar quartz movement that’s powered by light both natural and artificial. It’s a popular technology with Citizen having their own version called Eco-Drive watches. It’s accurate and reliable and can stay functioning after months in the dark. It also has a tough mineral crystal glass that’s been specially hardened to offer a good level of scratch and shatter resistance. You can read my full EQB-500D-1AER Casio Tough Solar watch review here. 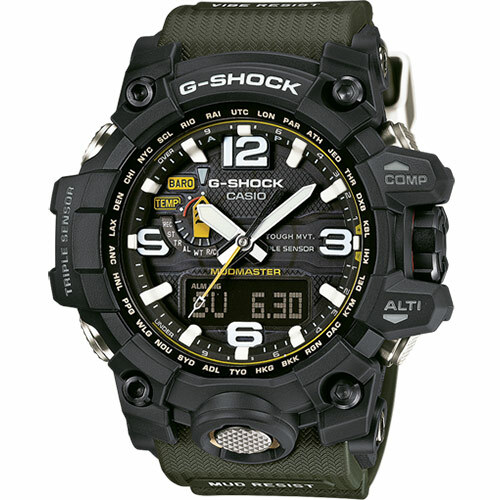 The G-Shock Mudmaster is one of Casio’s highest end watches available, and as such comes with that type of price tag. If you’re after one of the best highly functional rugged watches to stand out to any job, then this is more than likely the perfect watch for you. The Casio Mudmaster was designed for people whose work takes them into piles of rubble, dirt, and debris. It has a special vibration-resistant construction that allows it to continue working even when operating heavy machinery like cutters, drills and more to clear away large obstacles. It has a mud resistance construction that helps to ensure nothing gets into the watch and affects its running when the down and dirty work takes you deep into sludge and muck. They’ve achieved this Mud resistant design using multiple gaskets on the pipes that guide buttons and shafts. These pipes protect the buttons from impact as well as enhancing the operation of the buttons. The screw-in force of the screw lock bezel on an internal gasket is also used to increase the mud resistance. The new design of the bezel structure also lets you visually check whether the bezel has actually been screwed down adequately. As is common with G-Shock watches this timepiece has an oversized design with a 51mm stainless steel and resin casing that has a thickness of 15mm. The strap is made of rubber which as a processed surface to resemble a cloth band texture. It fastens with a buckle style clasp. The buttons of this Mudmaster Casio watch have a checkered surface for better grip even when wet which helps to assure better operation of the timepiece. This highly functional watch uses Multiband 6 to automatically adjust time settings based on the reception of one of six time calibration signals around the globe (two in Japan, United States, England, Germany). this makes it a very accurate and reliable watch. It’s powered by a Casio Tough Solar movement which means it uses solar powered from either natural or artificial light to run. Extra functions of this high end Casio G-Shock watch include a digital compass, barometric pressure/altitude reader, temperature reader, double LED illumination, screw in crown, chronograph, alarm, automatic calendar, 24 hour dial, and dual time display. It even comes with a 200m water resistance rating which I was expecting to be fair. You can read my full GWG-1000-1A3ER Casio Tough Solar watch review here soon. Thanks for taking the time to read through today’s excessive Casio Tough Solar watch review. I enjoyed taking the time to go through the technology with you and showcase some of their popular models. What was your favourite Casio Tough Solar watch? Comment below and let me know.